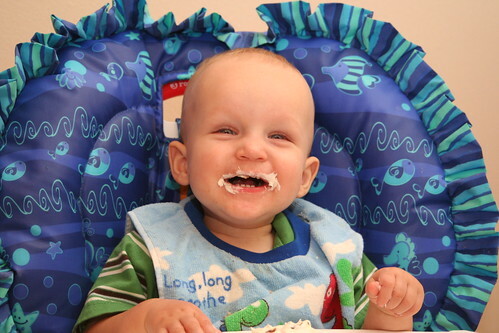 The C&C Burkman Family Blog:: Happy Birthday Carter!! I'm still having a hard time wrapping my head around the idea that one year ago, I was watching Carter be delivered. Looking back at all my many accomplishments over the last 365 days wouldn't make for a very interesting blog and might be a bit depressing for me, so we'll just focus on Carter's big day. 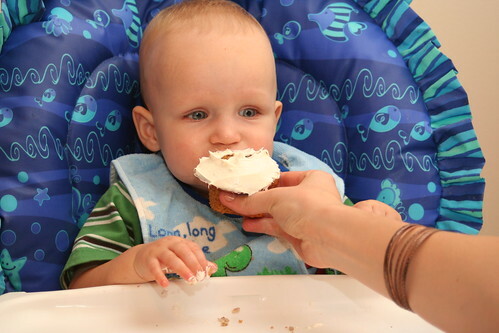 Carter also got to eat his first birthday "cake". We tried to be a bit healthy, so he got a pumpkin spice cupcake. Of course we covered it in wonderful, sugary frosting; negating the healthiness altogether. 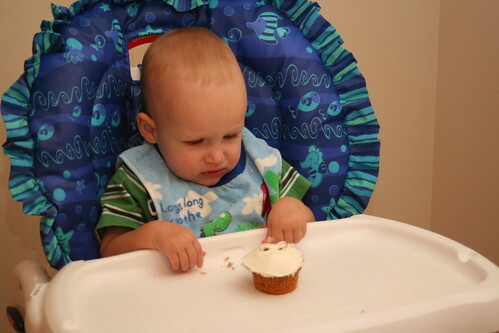 At first he was a bit apprehensive and didn't know what to think of the frosting. And if you haven't had enough multimedia in one post, here's a slide show of the whole cupcake adventure. Haha, that is great. He's already figured out the card and bopping his head. Now I just have to get Kung Fu Fighting out of my head. Oh Chris, thank you for telling Sam the funny blonde joke. I was laughing at work for about ten minutes. Hooray for carter! We're looking forward to his party on saturday. Happy Birthday Carter!! Isn't it crazy how time flies. Just wait, pretty soon you'll be celebrating your 7th kids 18th birthday. Those years will surely make good blogs. The card head bob thing totally cracked me up. I was laughing out loud. That is such a fun age. Happy Birthday Carter! OH MY GOODNESS! Carter is already 1! Crazy! Yay for Carter!!! I love Carter and I can't believe he's one already! What do we all have to show for ourselves? He just learned more in this one year than any of us will ever in a year, isn't that crazy to think about?! Happy Birthday Carter! I wish we could be there for your big day at the park:( It looks like you had a great birthday, and I bet you'll have a great day today. We love you! Happy Birthday!! 1 year old...getting old already! :) We miss you like crazy! Happy Birthday Carter!!! He is definately a cutie!! So glad you found our blog. Your little boy is just adorable. I look forward to keeping in touch. Have a great day. Those pictures are great! Carter is really adorable! It looks like he had a great 1st birthday! I'm like way late on this, I have been neglecting my blog hopping lately. That card was way cooler than that lame old horse though. We gave Hannah one of those cards that played music, all day long opening and closing for like a month. The batteries on those things lasts for what seems to be a lifetime. 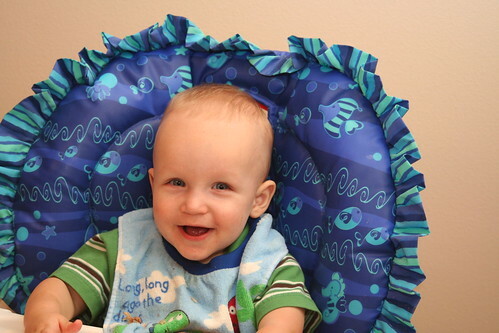 Congrats Carter on making it the first year of life! Happy Birthday Carter! I'm loving the cute cupcake pictures!